Size: base unit is 21" W x 17.5" D x 10.5" H, plus guard height. Requires electric outlet, 1000 watt 8.3 amps. Separate switches for each set of 5 rollers and for each drive motor. 20-30 minutes for large hot dogs from refrigerator to ready to eat. 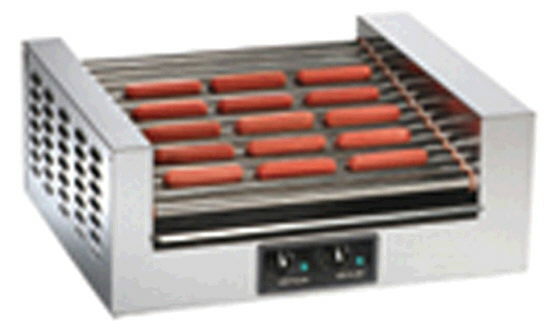 * Please call us for any questions on our hot dog roller type holds 20 rentals in Ft. Wayne IN, Warsaw, Syracuse, Auburn, South Bend, Indianapolis IN.